• Don’t spray directly onto your face. • Use only on exposed skin. • Avoid contact with lips and eyes. • Wash hands after application. • Don’t apply to cuts, abrasions, broken or irritated skin. • Wash off the repellent with soap and water when it is no longer needed. The chemical N,N-Diethyl-meta-Toluamide (DEET) has been widely regarded as the most effective insect repellent available for many years. DEET is available in several strengths suitable for use on skin. 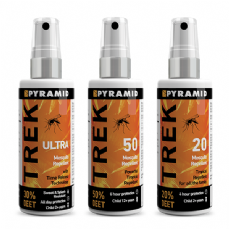 For use in tropical areas, a 50% DEET formulation such as Trek 50 provides effective protection for around 6 hours. If you want a longer-lasting DEET repellent which is also suitable for children, try Trek Ultra which lasts for 12 hours and can be used on ages 2+. For pregnant and breast-feeding women, we recommend using a DEET-Free or Natural Repellent. DEET should not be used on children under the age of two years. Over this age, a mild strength may be used but particular care must be taken to ensure they are not able to swallow repellent, and that it does not come into contact with their eyes or mouth. Saltidin® has been available for some 10 years, and is generally considered as the best DEET-Free repellent available. It provides equivalent protection to 50% DEET products, and can be safely used on children over the age of two years. Saltidin® is the active ingredient in the Trek Midge & Tick and Trek Sensitive insect repellents. There are many natural ingredient repellents available too, Citriodiol® (oil of lemon eucalyptus) has been tested and proven to be a good alternative to DEET. This is the active ingredient in Trek Natural. This has a fresh and pleasant smell and protects for up to 10 hours. It is suitable for children over the age of 6 months. If traveling to an area where insect borne diseases such as Malaria, Dengue Fever and West Nile Virus are a factor, we recommend choosing a DEET Mosquito Repellent.